Kremlin spokesman Dmitry Peskov, on 28 January, said there were “no discussions in government to extend major financial or military assistance to keep Mr. Maduro in power.” But Russia has militarily entered Venezuela ignoring the security culture of North America, the cost of war with the United States, and the well being of Venezuelans. China and Russia are trying hard to prop up the former President of Venezuela, Nicolás Maduro. Maduro, who with a military junta and backed by a drug cartel (the infamous Cartel of the Suns‘), tried to take over the country. Since 23 January, the democratically elected National Assembly (a quasi-parliament) has declared its leader (Juan Gerardo Guaidó Márquez) the interim President of Venezuela pending elections. Some 50 nations have recognized President Guaidó as the constitutionally-appointed leader of the country. Above: China Delivers on Medical Supply Promise. See Video Below. But Russia has been meddling in a serious manner by injecting more mercenaries and regular forces. That latter effort on 23 March is reportedly one of the riskiest things Russia could have done in America’s back yard. Reports say this raised the ire of Republican extremists including National Security Adviser (NSA) John Bolton. “The Treaty of the Americas”, a mutual self-defence cooperation agreement between most countries in North and South America, is now in play say many of Washington’s neocons. Venezuelan Air Force Sukhoi Su-30MK2, decorated in G-13 5th Anniversary & Venezuela Independence Bicentennial special tail art, landing at Barcelona, Venezuela. Russia needs to withdraw all military personnel from Venezuela as quickly as possible say three different unanimous FPMag sources in America who spoke to Melissa Hemingway on condition of anonymity. Meanwhile Russia claims that its military personnel are in the country to maintain training and other support standards for the numerous warfare equipment it has sold the country over the past decade. Supporting armament sales such as the Venezuelan Air Force Sukhoi Su-30MK2 shown above are what Russia claims its military is doing in Russia. Possibly this claim is made somewhat disingenuously. There are some 500 (estimated) Russian land-force mercenaries in the country, a few of whom Michel Francis (RSAC Nurse) spoke to. Her contacts said ‘they don’t fly air planes’. They claimed also, not to know that there are ‘Su-30s in Venezuela’. US President Donald Trump confirmed what some FPMag sources were saying when he commented mid-week to the press that he would be speaking to the leaders of China and Russia this weekend but publicly, emphatically, and angrily, told Russia to get out of Venezuela. Slowing down the recovery of Venezuela are both the Russian interference in the country and Donald Trump’s ill-advised sanctions. While American cargo aircraft carry loads of USAID to Colombia allegedly for Venezuela, Trump is imposing nation-wide tariffs on Venezuela that will further throttle the flow of foodstuffs and medicines into the country. American sanctions have also ended US sale of oil dilutants to Venezuela’s oil companies which is somewhat of a wasted energy because Russia has taken over the supply of those dilutants. On 22 March the Serengeti, a Russian tanker, arrived in Venezuela with a load of heavy crude oil thinners from the Russian oil giant, PJSC Rosneft Oil Company, a Russian integrated energy company headquartered in Moscow. While Venezuelan tankers Baghdad and Folegandros I have been making oil shipments to cash-paying customers in India according to Economic Times of India, Russia has also been facilitating oil shipments to that country in defiance of American sanctions. Listing the needs of patients in Venezuela. Food is desperately needed. Antibiotics are rare. Drugs for patients with chronic illness – medications like beta blockers, ace inhibitors, calcium channel blockers, IV ringers, saline, glucose, basic analgesics like acetaminophen, non-steroid anti-inflammatory drugs, anti-histamines, H2 and photon blockers, diabetes meds. and more. “Most goods are at risk of being stolen by Maduro’s thugs and sold on the black market,” notes nurse Michele Francis who was working at a Catholic hospital until supplies ran out. She then sought to do something about that since the middle of 2018. 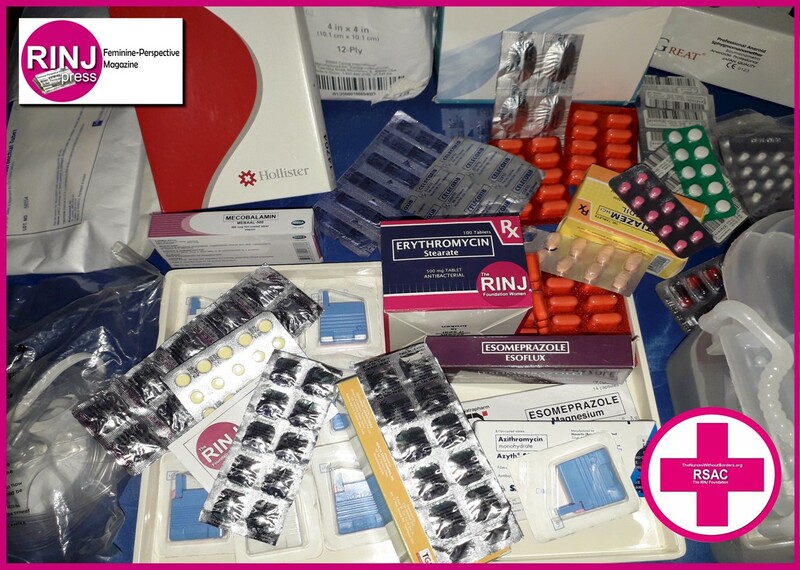 Numerous small Civil Society NGOs including The RINJ Foundation and several faith-based humanitarian groups have been shipping medical supplies across the Colombian border and operating or supporting remote clinics and hospitals keeping chronic patients alive when their maintenance medications stopped flowing within the Venezuelan ‘health care’ system. Watch China delivering 65 tons of medical supplies to Caracas, yesterday. China and the International Red Cross have both announced more massive plans for aiding Venezuelans who are dangerously falling prey to a completely collapsed ‘health care’ infrastructure. “Russia has defied the security culture in North America and forgets the Cuban Missile Crisis,” says private security contractor, Simon Baldock. “Moving Russian military assets into South America in support of Venezuela’s former leader Nicholas Maduro who has formed a military junta backed by Russia is an act of war against America,” the former IDF officer, now consultant, added as a warning. “We will probably be talking at some point,” Trump told the press after the White House warned Russia and other countries backing President Nicolas Maduro not to send troops and military equipment to Venezuela, which Russia has done. “I’ll be talking to a lot of people — perhaps President Putin, perhaps President Xi of China,” Trump said Friday. Mr. Baldock says that if the neoconservatives like National Security Advisor John Bolton get their way, the US will warn the Kremlin to get out, which warning it has done, and then following some preparatory steps which are currently underway, notes Baldock, will then invade. Baldock believes that NSA J. Bolton and many neoconservatives close to the US President who in fact has been more of a liberal in the past, are seeing Venezuela as a good opportunity for what neocons call the Ledeen Doctrine. Russia has only a limited ability to push its Army into Venezuela and does not have the air-combat naval assets to move into place, note Baldock. Russia also cannot financially afford to enter a war in defence of Maduro, the Wall Street Journal has repeatedly reported. “Every ten years or so, the United States needs to pick up some small crappy little country and throw it against the wall, just to show the world we mean business.” – Ledeen Doctrine – Attributed to American historian, neoconservative Michael Ledeen following his speech to the American Enterprise Institute in early 1992. We strongly caution actors external to the Western Hemisphere against deploying military assets to Venezuela, or elsewhere in the Hemisphere, with the intent of establishing or expanding military operations. We will consider such provocative actions as a direct threat to international peace and security in the region. We will continue to defend and protect the interests of the United States, and those of our partners in the Western Hemisphere, which are rooted in a shared respect for liberty, security, and the rule of law.